Two silver coffins rested head to toe in the sanctuary of a quiet church in Mitchellville, separated by white flowers and a yellow ribbon, draped with American flags, carrying the remains of a father and son -- "national treasures and American heroes" -- who were killed by a terrorist bomb half a world away. They were the Bartley men, a senior career diplomat and a college student who took after his father. Hundreds of their friends, including a dozen ambassadors and members of Congress, gathered in the cool pews of Largo Community Church and under the hot sun at Arlington National Cemetery yesterday to honor them -- and to comfort a family enduring a double tragedy. In the coffin on the left was the body of Julian Leotis Bartley Sr., 54, who was raised in working-class Queens, N.Y., but who had gone on to spend a lifetime serving his country in cities like Santo Domingo, Dominican Republic; Bogota, Colombia; Madrid; Tel Aviv; Seoul; and finally, Nairobi. He was among the most senior African Americans in the U.S. Foreign Service -- a pioneer, really -- and he was the highest-ranking U.S. official killed in explosions Aug. 7 at the American embassies in Nairobi and Dar es Salaam, Tanzania. In the coffin on the right was the body of his son, Julian "Jay" Bartley Jr., 20, a sophomore at the U.S. International University in Nairobi who followed his father around the globe and lived a life of adventure and foreign nightclubs and basketball. He inherited his father's devotion to helping others: teaching children to ride horses as a camp counselor, coaching a girls' basketball team in Nairobi and, most recently, working as a summer intern in the embassy. Both father and son died when the bomb exploded, leaving behind friends, relatives and colleagues on nearly every continent, as well as three grieving women: Susan, wife and mother; Edith, daughter and older sister; and Gladys Baldwin, mother and grandmother. The three sat together near the coffins yesterday, greeting a long line of mourners with hugs and kisses and sorrowful dignity. More than 250 people were killed -- 12 Americans -- and 5,000 wounded in the twin bombing attacks. Prabhi Guptara Kavaler, of Northern Virginia, another Foreign Service officer killed in Nairobi, was also buried at Arlington yesterday. Speakers at yesterday's memorial service for the Bartleys expressed some anger about the bombings. Retired ambassador Terence A. Todman, one of Julian's longtime friends and mentors, called them "the cowardly, inhumane, ungodly actions of vicious, deranged minds." But, for the most part, the mourners spoke of the full lives that the Bartley men led, of their families, their friendships and their contributions to the nation. They recalled Julian Bartley's distinguished career as a consular officer, a diplomat assigned to assist American citizens in distress abroad and to help foreigners navigate the legal maze of visiting or immigrating to the United States. It is not glamorous work, but it offers a chance to help people directly -- and Bartley loved it and excelled at it, rising to the rank of consul general during a 27-year career. When in the United States, Bartley lived in Northern Virginia and Bowie. "Julian was a superb professional who represented the best of our Foreign Service and the consular service," said Ambassador Ruth Davis, who heads the nation's Foreign Service Institute. "He was a source of strength and aid to those who needed him abroad. He represented us all very well when he did the work he loved so much." Davis recalled how Bartley volunteered to go the site where a hijacked Ethiopian airplane had crashed -- to keep the State Department informed and arrange to transport the remains and secure the personal effects of dead Americans -- and how he recently helped coordinate a search for an American teenager lost while hiking in the Kenyan mountains. Mourners said Bartley took personal pride in helping immigrants enter the United States, whether it meant traveling to remote villages to describe U.S. visa rules or making sure a U.S. soldier who married a Korean woman could get his wife into the country or going out of his way to make things easier for a Kenyan student attending Spelman College. They said Bartley was often the first American many people overseas ever met -- and that he always left a good impression. 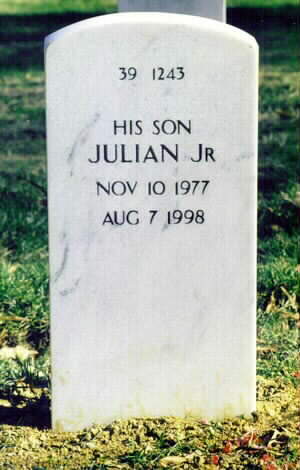 "Julian never met a person he didn't like," said U.S. Rep. Bennie Thompson (D-Miss. ), a longtime friend for whom Bartley once served as a foreign affairs adviser. "It was quite exceptional to have someone in the office who was more popular than the congressman. Everybody came to see Julian." Other colleagues recalled how Bartley established Caribbean cultural and educational exchanges with the United States, how he taught a graduate seminar at a local university in Seoul and how he established a student exchange program between a Korean university and a historically black college in America. But friends remembered the little things, the long talks at night, the phone calls from overseas. They spoke of his love of cigars, jazz music, good Spanish wine, and of his jokes, good and bad, but always told with enthusiasm. Bartley had no siblings, but he joined Alpha Phi Alpha fraternity at the historically black Tennessee State University in Nashville. He remained active and dozens of his fraternity brothers attended yesterday's service. Bartley made friends around the world, and it seemed his son did the same. A ROTC cadet who graduated from the International School of Kenya last year, Jay was known for his ability to fix machines, his skill at horseback riding, his love of nature, his fondness for partying and his interest in foreign affairs. One friend described him as a "Renaissance man" with "a quiet and profound wisdom." "How is that possible? He's only 20 years old. But Jay knew so much, he lived such a positive life," said Ayanna Dunn, a close family friend who said she considered Jay a brother. "He lived on almost every continent, he traveled around the world. His life was very full." Delivering the eulogy, the Rev. Daniel Webster Aldridge, a fraternity brother of Bartley's, described the Bartley men as "the descendants of slaves now representing the best that this country has to offer." The pair did not receive military honors at Arlington National Cemetery, but President Clinton signed a waiver permitting them to be buried there on a sloping plot alongside veterans and their families. In a solemn ceremony, pallbearers lifted both flag-draped coffins simultaneously, carried them to the adjacent grave sites, and set them down. Then, soldiers lifted the flags, one at a time, and held them taut. The soldiers folded one flag into a tight triangle, passing it from white-gloved hand to white-gloved hand. With a few words of comfort, Deputy Secretary of State Strobe Talbott presented it to Susan Bartley. Then, the flag-folding ritual was repeated. Undersecretary of State Thomas R. Pickering presented the second flag to Baldwin. The bomb that ripped apart the U.S. Embassy in Nairobi on Friday devastated one American family by claiming a father and son. 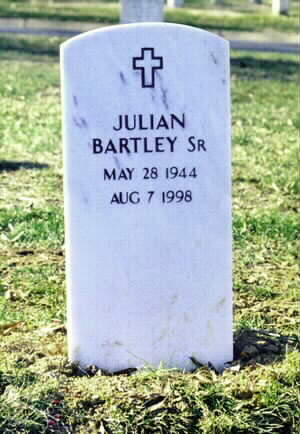 Julian Bartley Sr., the embassy's consul general, and his son, Jay, a college student who was working there for the summer, were among the hundreds of people who were killed when two bombs exploded almost simultaneously at the U.S. embassies in Kenya and Tanzania. Late yesterday afternoon, Edith Bartley learned that she had not only lost her brother, but that her father was found dead among the rubble, becoming the 12th American victim of the blast, according to a statement she released through the State Department yesterday. He had been reported missing. Louis Segesvary, the former spokesman for the embassy in Nairobi, described Julian Bartley as a unique diplomat who, in about two years as consul general, showed his commitment to reaching out to all Kenyans, as well as the Americans who also lived there. "I will always remember him as a man who was not shut up in his own box," said Segesvary, who is now spokesman for the State Department's African Bureau. "He had a very broad, very humane vision of what it meant to be a diplomat." Segesvary, who was assigned to the embassy in Nairobi until a year ago, said he worked closely with Bartley on an outreach program to help Kenyans better understand how to apply for visas. Both men traveled to Kisumu, Kenya's third largest city, located near Lake Victoria, to explain complicated visa procedures to the people there. "He always had his eyes focused on the community at large and our role to build positive relations with all of the Kenyans," Segesvary said. "You could not have asked for more from a consul general and a diplomat overseas . . . He was such a warm, generous human being, and I will miss him a great deal." His daughter said, "On behalf of my family, I would like to extend my deepest and heartfelt condolences to all family members worldwide who lost a loved one or were affected by the horrific bombings of our American embassies in East Africa." Edith Bartley, 25, is a student at the University of Missouri Law School. Julian Bartley, 55, a Jacksonville, Fla., native, was a senior diplomatic officer who joined the Foreign Service 24 years ago, according to his daughter. He had served in the Dominican Republic, Colombia, Spain, Israel and Korea before being assigned to Kenya. He also studied at the National War College and had been a counselor on international affairs to Rep. Bennie Thompson (D-Miss.). Jay Bartley, 20, was a student at the United States International University in Nairobi and was working at the embassy temporarily. The death toll from the bombings continued to rise yesterday as rescue teams keep looking for victims. The Nairobi blast was by far the more severe, claiming all but 10 of those killed in the explosions. Nearly 5,000 people were injured and about 560 remain hospitalized. No Americans were killed in Tanzania; all 12 died in Kenya. Edith Bartley and her mother, Sue, asked that the media leave them alone so they can grieve privately. A family member of another bombing victim, Uttamlal T. "Tom" Shah, of Vienna, Va., said, "I would just like you to respect our mourning, please," when called by a reporter. Other victims' family members, such as Lori Dalizu, of Southeast Washington, whose mother died in the Nairobi bombing, found comfort in reminiscing about those they had lost. Jean Dalizu, 60, an executive assistant in the Kenya-U.S. liaison's office, had lived in Kenya since 1972. But her children -- all of whom had spent time in Kenya but eventually returned to the United States -- said she still longed for things American. She often asked them to send her unusual items they could find with the American flag emblazoned on them. Recently Lori sent her two T-shirts with flags on themand a purse with a flap designed like an American flag. Jean Dalizu had lived long enough in Kenya to become a shrewd bargainer in its markets. Her children recalled how their mother would rail at merchants who tried to overcharge her. "She would say, 'I'm a Kenyan. I'm not a tourist,' " her daughter Temina Dalizu, 26, of Silver Spring, said as she sat yesterday in her sister's Southeast Washington apartment. Lori Dalizu said she learned of the bombing from an aunt who called her at 6:30 a.m. Friday. When she saw the television footage of the bombing sites, she said, "I lost my breath because the bomb had gone off on the side where my mother worked." The Dalizu children said they learned of their mother's death from the State Department before their father, Egambi, a political science professor at the University of Kenya, knew. Egambi and Jean Dalizu met when he was a student at Howard University. They were married in her parents' home in 1963. When Lori Dalizu reached her father, she said he sounded out of breath. "He had just walked into the house. He went from hospital to hospital . . . and could not find her. . . . So I had to tell my father that she did not make it," she said. "She always told us the dangers of being there," said Temina Dalizu, who spoke to her mother for about a half-hour the day before the blast. "She knew anything could happen at any time." The bodies of the Americans killed in Nairobi will be flown to the United States tomorrow, State Department officials told victims' relatives yesterday, and a memorial service has been scheduled for 10 a.m. Wednesday at Andrews Air Force Base. It was unclear last night whether that ceremony would be public or private. In Lawrenceville, Ga., the large family of Louise Martin, 45, a veterinarian, geneticist and epidemiologist with the U.S. Centers for Disease Control and Prevention, has begun gathering at the home of one of her sisters, Susan Bryson, to make funeral arrangements. Dwight Davis, a neighbor of Bryson's who was fielding phone calls at her home yesterday, said Bryson knew Friday that her sister was missing. But on Saturday, Martin's husband called with the bad news. "She was a wonderful person," said Davis, who had met Martin when she visited Bryson, most recently last summer. "She loved her work. She enjoyed her job. She loved her country and looked forward to opportunities to serve it." Staff writer Cheryl W. Thompson contributed to this report. A list of American victims in Friday's bombing at the U.S. Embassy in Nairobi, Kenya. Home towns for all the victims were not available. Jean Dalizu, 60, Defense Attache's Office, Washington, D.C.
Prabhi Kavaler, 46, General Services Office, McLean, Va.
Uttamlal T. "Tom" Shah, Political Section, Vienna, Va.